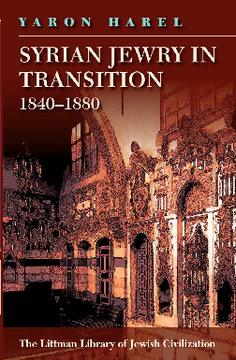 This pioneering study offers a comprehensive account of Syria's key Jewish communities at an important juncture in their history that also throws light on the broader effects of modernization in the Ottoman empire. The Ottoman reforms of the mid-nineteenth century accelerated the process of opening up Syria up to European travellers and traders, and gave Syria's Jews access to European Jewish communities. The resulting influx of Western ideas led to a decline in the traditional economy, with serious consequences for the Jewish occupational structure. It also allowed for the introduction of Western education, through schools run by the Alliance Israélite Universelle, influenced the structure and the administration of Jewish society in Syria, and changed the balance of the relationship between Muslims, Christians, and Jews. Initially Syria's Jewish communities flourished economically and politically in these new circumstances, but there was a developing recognition that their future lay overseas. After the opening of the Suez Canal in 1869, the bankruptcy of the Ottoman empire in 1875, and the suspension of the Ottoman constitution in 1878, this feeling intensified. A process of decline set in that ultimately culminated in large-scale Jewish emigration, first to Egypt and then to the West. From that point on, the future for Syrian Jews lay in the West, not the East. Detailed and compelling, this book covers Jewish community life, the legal status of Jews in Syria, their relationship with their Muslim and Christian neighbours, and their links with the West. It draws on a wide range of archival material in six languages, including Jewish, Christian Arab, and Muslim Arab sources, Ottoman and European documents, consular reports, travel accounts, and reports from the contemporary press and by emissaries to Syria of the Alliance Israélite Universelle. Rabbinic sources, including the archive of the chief rabbinate in Istanbul, are particularly important in opening a window onto Syrian Jewish life and concerns. Together these sources bring to light an enormous amount of material and provide a broad, multifaceted perspective on the Syrian Jewish community. The Hebrew edition of the book was the winner of the Ben Zvi Award for Research in Oriental Jewry in 2004.